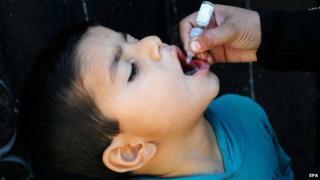 Militants say polio teams are spies or that the vaccine causes infertility. The shootings are the latest in a series of attacks on Pakistani polio teams. The violence has claimed the lives of at least 70 polio workers over the last four years. Local media report that the polio team went missing in the Zhob district of Balochistan, near the border with Afghanistan. Their bodies were found early on Tuesday morning. The relatives of the victims have taken to the streets in the city of Zhob to protest against their deaths, according to local reports. "The situation is very tense and people are angry at security forces who are unable to trace the culprits," a senior official in the city told Pakistan's Express Tribune. Another official told Dawn newspaper that the Balochistan authorities had postponed an anti-polio campaign in the Quetta, Zhob, Sherani and Sibi districts because of the security threat. The BBC's Shahzeb Jillani says the attacks are undermining Pakistan's efforts to bring the spread of polio under control. The country now has the biggest number of polio cases worldwide and is one of only three countries where the disease is still endemic - the others being Nigeria and Afghanistan. Islamist militants in Pakistan oppose polio vaccination, saying it is a western conspiracy to sterilise Pakistani children. Officials cite this, and the killings of health workers, as the major reasons for the increase of polio cases last year. The country recorded its highest number of polio cases for 15 years in October 2014.